By the power invested in me through Blogger, I will spread the word about what should be a rather large point of contention, a Gorilla-femur-bone-to-pick, if you will, between free speech advocates, civil rights groups, feminists, people who generally support the fundamental tenets of Western democracy...and the Italian court system. So this is what I've decided to do...anyone who is reading this post (and all your email buddies), needs to follow these links or send email to the following addresses and 1) inquire why they won't publicly defend Ms. Fallaci, 2) Ask them to make a statement about here situation, 3) tell them whatever it is that you feel appropriate in such a context. Remember to consider the stated goals of these organizations, which I will try to provide along with their contact information. ACLU...whose goal is to preserve the protections spelled out in the Bill of Rights in order to ensure individual liberty. (Included in the Bill of Rights is the so-called First Ammendment, which guarantees something called "freedom of speech"). 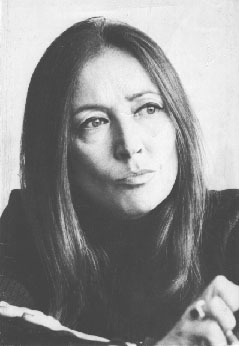 So Ms. Fallaci does live in New York, is an "American", where is the ACLU in at least denouncing the trial? Ask your local affiliate....but they may be too busy to answer your real concerns about a real violation of free speech happening to an inhabitant of New York...they just might be too busy doing things like preserving the right of students not to stand and recite the pledge of allegiance at school....you know, really important and patriotic duites...so to hell with an author who will be fined for one freakin' sentence that wasn't all that offensive to Islam anyway. AmnestyInternational USA: Does the list of rights that this organization deems inalienable to the point of "human rights" include the freedom of speech? Feel free to inquire. Human Rights Watch: whose goal is to "defend human rights worldwide"...well, let's do it, shall we? European Court of Human Rights should have something to say about the matter, being as they do promote Article 9: "Freedom of Thought, Conscience and Religion" as well as Article 10: "Freedom of Expression". Contact Info Here. You could also contact CNN, NPR, FoxNews, NBC, CBS or ABC and ask them why they think Karl Rove's non-indictment is such a big story but that a violation of a woman's right to mildly insult a religion in a free Western country isn't. I don't care whether you are liberal, conservative, progressive, Christian, or Muslim...this woman's right to say something that's relatively tame about Islam should not be trampeled upon by the Italian court system. SIDENOTE: If the point of law upon which this case rests really is that Italians are not allowed to promote "outrage" against a religion...then of course there needs to be a proper definition of "ourtage", which I'm sure there is, unfamiliar as I am with the Italian legal system. It would seem to me, however, that by referring to Islam as a "pool...that never purifies," one has committed a much less grievous offense than, say, calling for Muslims to "Behead those who insult Islam". I mean, I'm not an international trial lawyer or anything, but it seems like you could make a pretty convincing case for Ms. Fallaci by way of comparison. Does anyone sense a double standard? Just asking. The Most Important Speech EVER!! !